Check this box to Add Printing Charges! Driver Panel: 13 ft. x 4 ft. Conductor Panel: 10 ft. x 4 ft.
Back Panel: 5 ft. x 2 ft.
Driver Panel: 13 ft. x 3 ft.
Driver Panel 2: 7 ft. x1.5 ft. Conductor Panel 1: 10 ft. x 3 ft. Conductor Panel 2: 7 ft. x 1.5 ft. These buses comply all over Punjab and also covers all of Northern India i.e. Delhi, Haryana, Jammu, Himachal, Rajasthan, Uttrakhand, UP etc. Pathankot-Abohar Via Batala, Gurdaspur, Amritsar, Taran Taran, Talwandi Bhai, Zira, Makhu, Ferozpur, Jalalabad, Faziala. Pathankot-Abohar Via Batala, Gurdaspur, Amritsar, Taran Taran, Talwandi Bhai, Zira, Makhu, Ferozpur, Kotkapura Faridkot, Muktsar, Malout. 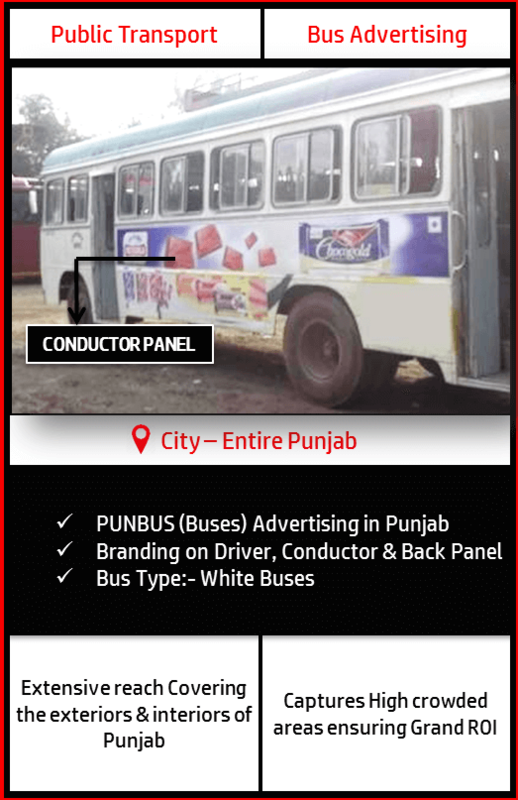 Muktsar-Pathankot Via Bathinda, Goniana, Jaitu, Ferozpur, Fardikot, kotkapura, makhu, zira, TalwandiBhai, Taran Taarn, Amritsar, Gurdaspur, Batala. 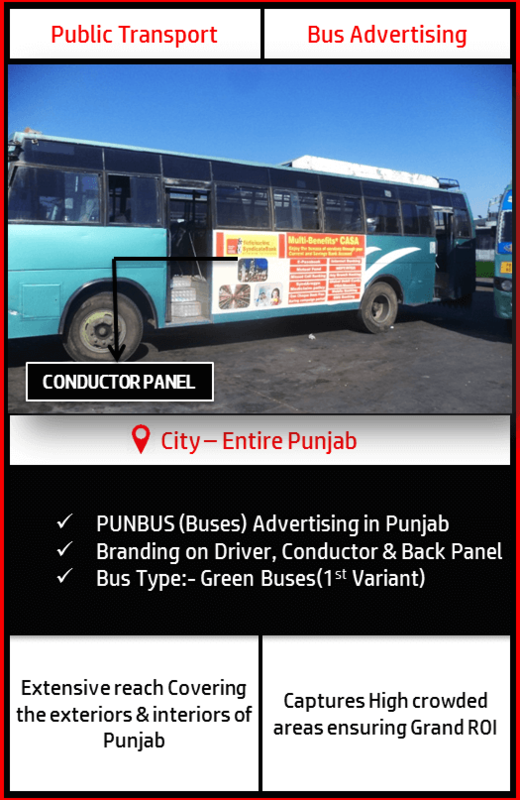 Muktsar-Chandigarh Via Bathinda, Rampura Phul, Tapa, Barnala,Sanguru, Bhawanigarh, Patiala, Rajpura,Zirakpur. Chandigarh- Abohar Via Kharar, Morinda, Samarala, Ludhiana, Mullanpur, Jagroan, Moga, Bhagapurna, Kotkapura, Muktsar, Malout. 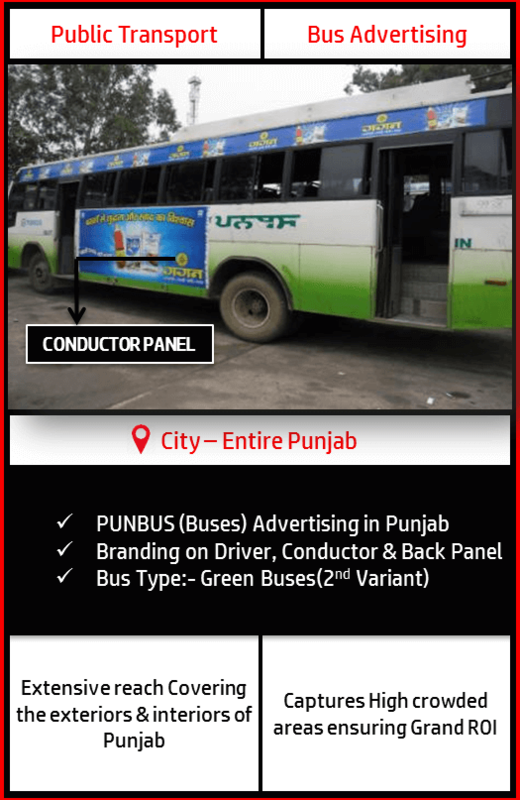 Chandigarh-Abohar Via Zirakpur, Rajpura,Patiala, Sanguru, Baranala, Tapa, Rampura Phul, Bathinda, Gidharbaha, Malout. 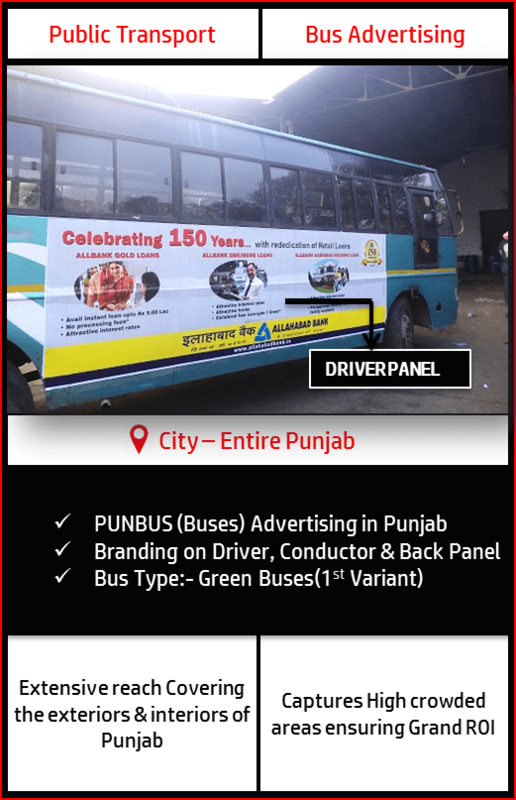 Chandigarh-Malerkottla Via Chnni, Sirhind, Mandigobingarh, Khnna, Payal. Nagal-Pathankot Via Una, Hoshiarpur, Jalandhar, Dasua, Mukerain. Patti-Abohar Via Hari ka Pattan, Taran Taarn, Talwandi Bhai, Zira, Makhu, Ferozpur, Jalalabad, Faziala. 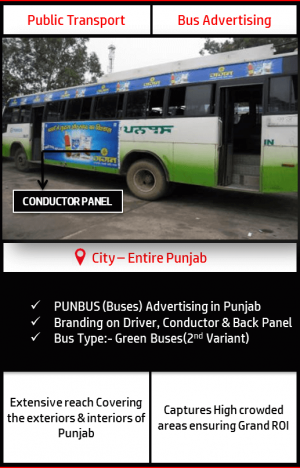 Chandigarh-Pathankot Via Kharar, morinda, Ropar, Balachor, Hoshiarpur, Dasua, Mukeria. 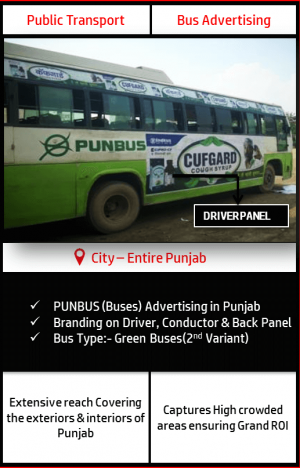 Chandigarh-Pathankot Via Kharar, Morinda, Sirhind, Samarala, Ludhiana, Phillaur, Phagwara, Jalandhar, Tanda, Dasua, Mukeria. Amritsar-Mansa Via Taran Taarn, Zira, Moga, Barnala. Ludhiana-Patiala Via Mandi Ahmedgarh, Malerkottla, Nabha, Patiala. 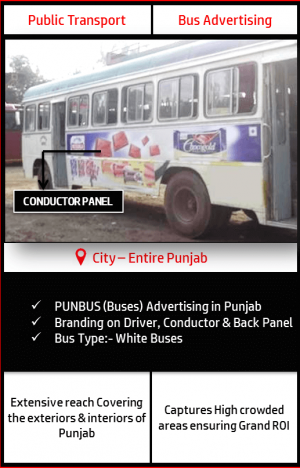 Ropar-Sadulgarh Via Zirakpur, Rajpura, Patiala, Bhagwanigarh, sunam, Bhkki, Mansa. 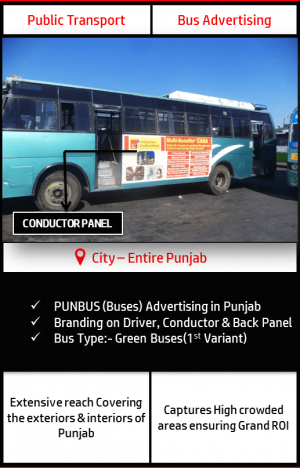 Chandigarh-Amritsar Via Kharar, Morinda, Ropar, Balachor, Nawanshahr, Banga, Pharwara, Jalandhar, Kartarpur, Beas. 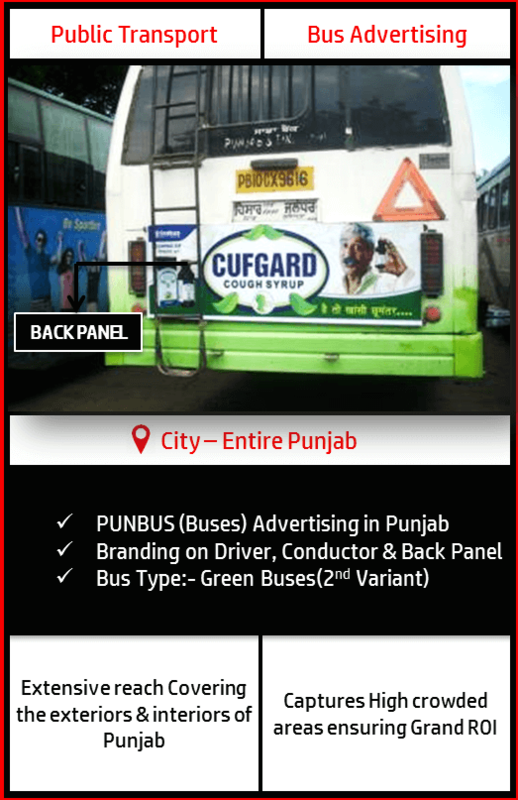 Branded buses images will be shared prior Campaign startup. The Images with complete information i.e. Registration Number, Number Plates etc. will be shared after execution. We recommend Printing and Mounting to be done From BMK to avoid any inconvenience from the client’s end. 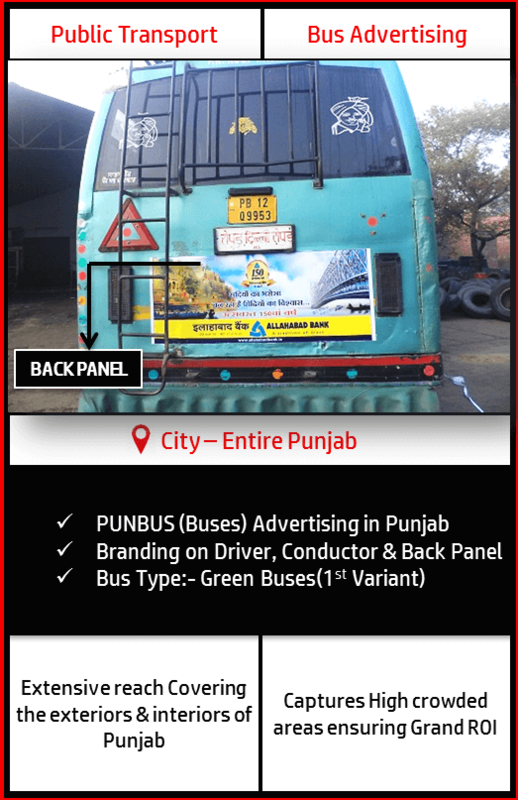 The public vehicle stands on the most crowded Place of the City which results in the unbeatable Branding Mileage for the Client even when the Vehicle is standing at one place. 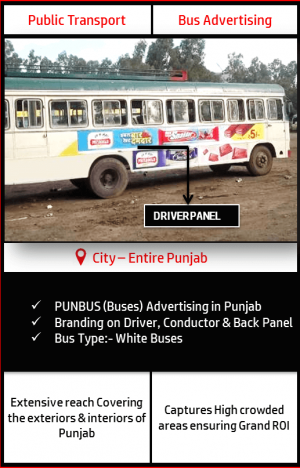 Punjab Roadways Ad Campaign creates an eye Catching impact on the viewers’ mind which consequently grabs the attention of massive road users. 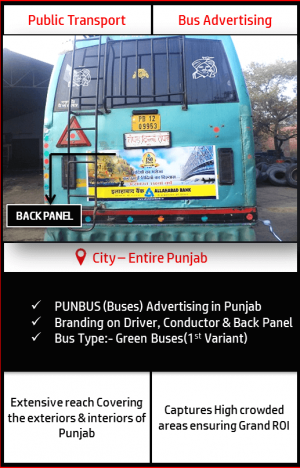 This medium ensures the High Display Area since almost the entire bus is covered with 3 sides display of the client’s brand i.e. 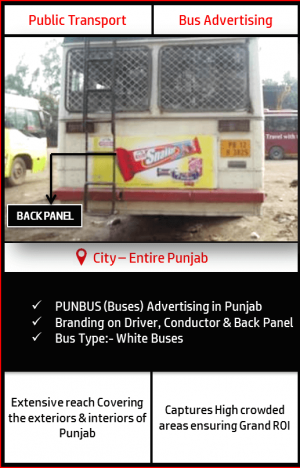 Driver Panel, Conductor Panel & Back Panel. Quite flexible in terms of duration of the campaign (Highly Recommended for long-term campaigns). 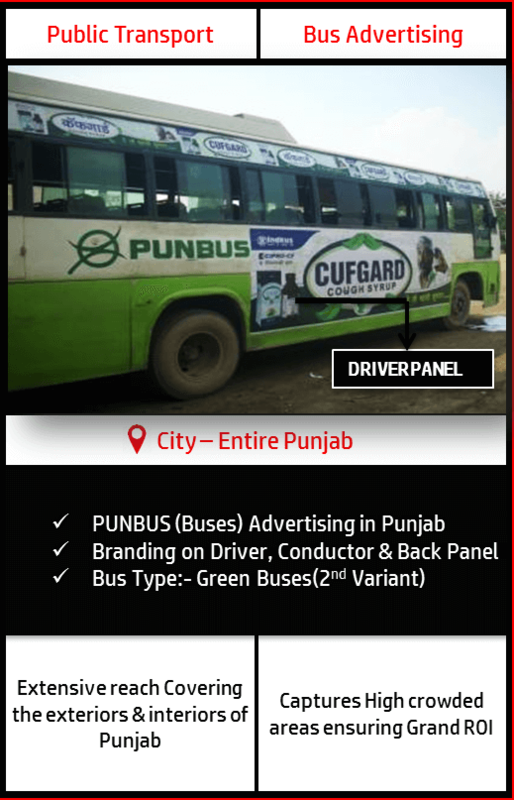 Advertising Campaign on PUNBUS provides an extensive reach covering the interiors & exteriors of Punjab & provide the exposure to the highly crowded areas of the city ensuring Huge Brand Recall & Great ROI. Booking Your Ads on Punjab Roadways Buses is now easy & affordable with BIG MEDIA KART, the leading Outdoor Advertising Agency in Punjab, India.